Our new supersonic helicopter servo is fast and furious fun! 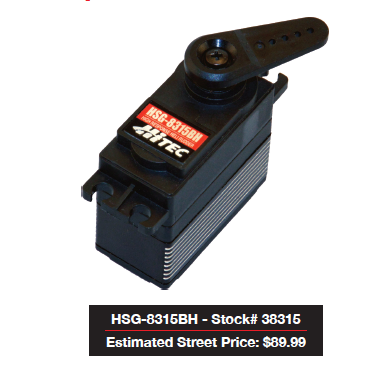 Built with ultra-speed in mind, the HSG-8315BH has a robust Karbonite and aluminum hybrid gear train, high-performance coreless motor and high resolution, low dead band circuitry. It is the perfect tail rotor servo for 500+ size electric and 50-size and up gas pilots whose maneuvers and aerobatics demand the utmost precision and acceleration. Rated at 7.4 volts for 2S LiPo operation with a 560Hz refresh rate, the HSG-8315BH rivals anything like it on the market. Throw in its 25-tooth standard spline and dual ball bearings and it is sure to become one of your favorite servos! Previous Video: Americas Best Annual RC Sale is in Process!